There is a critical need for tools and methodologies capable of managing aquatic systems in the face of uncertain future conditions. We provide methods for conducting a targeted watershed assessment that enables resource managers to produce landscape-based cumulative effects models for use within a scenario analysis management framework. Merriam, E. R., Petty, J. T., Strager, M. P. Watershed Planning within a Quantitative Scenario Analysis Framework. J. Vis. Exp. (113), e54095, doi:10.3791/54095 (2016). There is a critical need for tools and methodologies capable of managing aquatic systems within heavily impacted watersheds. Current efforts often fall short as a result of an inability to quantify and predict complex cumulative effects of current and future land use scenarios at relevant spatial scales. The goal of this manuscript is to provide methods for conducting a targeted watershed assessment that enables resource managers to produce landscape-based cumulative effects models for use within a scenario analysis management framework. Sites are first selected for inclusion within the watershed assessment by identifying sites that fall along independent gradients and combinations of known stressors. Field and laboratory techniques are then used to obtain data on the physical, chemical, and biological effects of multiple land use activities. Multiple linear regression analysis is then used to produce landscape-based cumulative effects models for predicting aquatic conditions. Lastly, methods for incorporating cumulative effects models within a scenario analysis framework for guiding management and regulatory decisions (e.g., permitting and mitigation) within actively developing watersheds are discussed and demonstrated for 2 sub-watersheds within the mountaintop mining region of central Appalachia. The watershed assessment and management approach provided herein enables resource managers to facilitate economic and development activity while protecting aquatic resources and producing opportunity for net ecological benefits through targeted remediation. Anthropogenic alteration of natural landscapes is among the greatest current threats to aquatic ecosystems throughout the world1. In many regions, continued degradation at current rates will result in irreparable damage to aquatic resources, ultimately limiting their capacity to provide invaluable and irreplaceable ecosystem services. Thus, there is a critical need for tools and methodologies capable of managing aquatic systems within developing watersheds2-3. This is particularly important given that managers are often tasked with conserving aquatic resources in the face of socioeconomic and political pressures to continue development activities. Management of aquatic systems within actively developing regions requires an ability to predict likely effects of proposed development activities within the context of pre-existing natural and anthropogenic landscape attributes3, 4. A major challenge to aquatic resource management within heavily degraded watersheds is the ability to quantify and manage complex (i.e., additive or interactive) cumulative effects of multiple land use stressors at relevant spatial scales2, 5. Despite current challenges, however, cumulative effects assessments are being incorporated into regulatory guidelines throughout the world5-6. Targeted watershed assessments designed to sample the full range of conditions with respect to multiple land use stressors can produce data capable of modeling complex cumulative effects7. Moreover, incorporating such models within a scenario analysis framework [predicting ecological changes under a range of realistic or proposed development or watershed management (restoration and mitigation) scenarios] has the potential to greatly improve aquatic resource management within heavily impacted watersheds3, 5, 8-9. Most notably, scenario analysis provides a framework for adding objectivity and transparency to management decisions by incorporating scientific information (ecological relationships and statistical models), regulatory goals, and stakeholder needs into a single decision-making framework3, 9. We present a methodology for assessing and managing cumulative effects of multiple land use activities within a scenario analysis framework. We first describe how to appropriately target sites for inclusion within the watershed assessment based on known land use stressors. We describe field and laboratory techniques for obtaining data on the ecological effects of multiple land use activities. We briefly describe modeling techniques for producing landscape-based cumulative effects models. Lastly, we discuss how to incorporate cumulative effects models within a scenario analysis framework and demonstrate the utility of this methodology in aiding regulatory decisions (e.g., permitting and restoration) within an intensively mined watershed in southern West Virginia. Identify the dominant land use activities within the target 8-digit hydrologic unit code (HUC) watershed that are impacting physicochemical and biological condition3, 7. Note: This methodology assumes pre-existing knowledge of important stressors within the watershed of interest. However, consulting regulatory agencies or watershed groups familiar with the system can aid in this effort. Select landscape-based measures of dominant land use activities [e.g., 2011 National Land Cover Database (NLCD)] 3, 7. Consult published literature to help identify the best landscape-based measures for each land use activity10. Contact natural resource agencies to identify and obtain region-specific landscape datasets that are available for use. However, it may be necessary to create new landscape variables or datasets. Tabulate land cover and use attributes to the 1:24,000 or 1:100,000 national hydrography dataset (NHD) catchments using Geographic Information (GIS) software. Ensure each 1:24,000 or 1:100,000 catchment has a unique identifier. Use any user-defined numeric or categorical identifier as the unique identifier. Tabulate vector data (e.g., points or lines) falling within each catchment. Summarize all vector features within each catchment using the Tabulate Intersection tool within the Statistics toolset of the Analysis toolbox. Select the NHD catchment layer as the Input Zone Feature, the catchment unique identifier as the Zone Field, and the vector dataset of interest as the Input Class Feature. Join the tabulated landscape attributes to the catchment layer. Right click on the catchments layer in the table of contents and select Joins and Relates from the dropdown menu and Join from the subsequent menu. Select the unique identifier as the field that the join will be based on, the output table from 1.3.2.1 as the table to be joined, and the unique identifier as the field in the table that the join will be based on. Tabulate raster data using the Tabulate Area tool located within the Zonal toolset of the Spatial Analyst toolbox. Load the Spatial Analyst extension. Select Extensions from the Customize menu. In the Extensions dialog box, check the box that corresponds to the Spatial Analyst extension. In the Tabulate Area dialog box, select the NHD catchment shapefile as the input raster or feature zone data, the unique identifier (e.g., FEATUREID) as the zone field, and the land cover dataset (e.g., NLCD) as the input raster or feature class data. Join the tabulated landscape attributes to the catchment layer following protocols in step 1.3.2.2, with the tabulate area results table as the join table. Accumulate landscape attributes for all NHD catchments. Download the NHDPlusV2 Catchment Attribute Allocation and Accumulation Tool (CA3TV2) at http://www2.epa.gov/waterdata/nhdplus-tools. Use the accumulation function of CA3TV2 for accumulation of attributes for 1:100,000 NHD catchments 11. Note: We used custom written code that accumulates landscape attributes for 1:24,000 scale NHD watersheds12. Detailed instructions for using CA3TV2 are integrated into the tool and can be accessed via the Help function. Select NHD catchments as study sites based on accumulated landscape attributes. Create a scatter plot of all NHD catchments with respect to accumulated values of major land use activities (Figure 1A). Select study sites (approximately 40 sites per 8-digit HUC watershed) to represent the full range of influence from dominant land use activities found within the target watershed (Figure 1B). 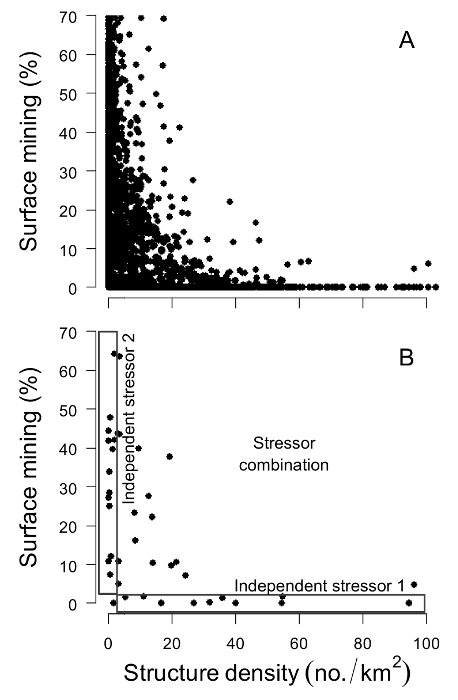 Select sites within independent stressor gradients (i.e., influenced by a single land use activity) and stressor combinations (i.e., influenced by multiple land use activities) (Figure 1B). Ensure that study sites are spatially distributed throughout the target watershed and independent of one another with respect to downstream drainage. Ensure that sites falling within each individual and combined stressor gradient also have similar average basin areas. Figure 1. Hypothetical scatter plot of NHD catchments with respect to influence from 2 land use activities. Magnitude of influence of 2 land use activities across all NHD catchments within the hypothetical watershed (n=4,229) (A). Selected study sites (n=40) that represent the full range of observed conditions within the watershed with respect to independent and combined stressor gradients (B). Please click here to view a larger version of this figure. Note: All data for each site should be collected during the same site visit at normal base flow conditions. Protocols presented herein represent standard operating procedures for the West Virginia Department of Environmental Protection (WVDEP)13. It may be more appropriate to use state or federally recognized procedures for the specific watershed being assessed. Delineate the sampling reach for each site as 40× active channel width (ACW), with maximum and minimum lengths of 150 and 300 m3, 7. Sample water quality attributes from locations with moving water that are characteristic of the entire sampling site (e.g., not directly influenced by tributary or drainage pipe inputs). Obtain instantaneous measures of dissolved oxygen, specific conductivity, temperature, and pH using handheld sensors. Calibrate sensors prior to each sampling event following manufacturer instructions. Rinse filtration equipment with deionized water prior to water sample collection. Filter 250 ml of water (mixed cellulose ester membrane filter, 0.45 µm pore size) for analysis of dissolved metals. Fix to a pH<2 to ensure metals remain dissolved in solution. Note: The correct volume of acid can be added to the water sample following sample collection. Alternatively, the correct volume can be added to the bottle prior to the sampling event. The volume required to fix to a pH<2 is dependent upon acid strength. For the study described here, collect a single filtered sample from each site and fix with nitric acid for determination of dissolved Al, Ca, Fe, Mg, Mn, Na, Zn, K, Ba, Cd, Cr, Ni, and Se3, 7. Note: Selection of analytes should be guided by watershed-specific land use activities. Collect 250 ml unfiltered sample(s) by completely submerging the sample bottle in the water column. Gently squeeze the bottle to expunge any remaining air and simultaneously place the cap on the sample bottle. Fix the sample(s) to a pH <2 if necessary (e.g., prevent biological activity from affecting nutrients). For the study described here, collect two unfiltered samples from each site. Fix the first with sulfuric acid for determination of NO2 and NO3 and total P. Do not fix the second unfiltered sample and use it to determine total and bicarbonate alkalinity, Cl, SO4, and total dissolved solids3, 7. Obtain a field blank for each fixative used during each sampling event. Obtain field blanks by following all protocols for sample collection (i.e., rinsing, filtering, fixing) using deionized water as the final sample. Note: Field blanks are used to identify contamination in sample collection and analysis. Store all water samples at 4 °C until all analyses are completed. Ensure all analytes are measured within their specified holding time14. Measure discharge at each sample site. Divide the wetted stream width into equal-sized increments. Measure depth and average current velocity at the mid-point of each section. Using a depth gauge rod, measure depth as the distance from the stream bed to the water's surface. Using a current meter, measure water velocity at 60% water depth. Calculate discharge as the sum of the product of velocity, depth, and width across all sections. Sample the macroinvertebrate community at each site. Obtain kick samples (net dimensions 335 × 508 mm2 with 500-µm mesh) from 4 separate representative riffles distributed throughout the entire length of the sampling reach. At each kick location, place the kick net perpendicular to stream flow and disturb a 0.50 × 0.50 m2 (i.e., 0.25 m2) area of the stream bed immediately upstream. Ensure all organisms and debris flow downstream into the kick net. Combine organisms and debris from the 4 kick samples into a single composite sample (representing 1.00 m2 of the stream bed) and immediately preserve with 95% ethanol. Measure physical habitat quality and complexity throughout the stream reach. 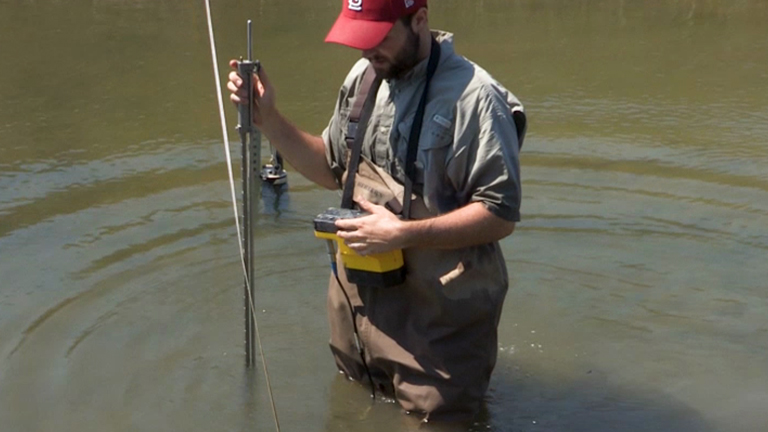 Take measurements of water depth, hydraulic channel-unit type, sediment class, and distance to fish cover object at evenly spaced points along the thalweg (portion of the stream through which the main or most rapid flow occurs). Take measurements every 1 ACW for streams <5 m wide and every 0.5 ACW for streams >5 m wide15. Classify the channel unit within which each thalweg location is located (e.g., riffle, run, pool, or glide)16. Randomly identify a piece of sediment and determine its Wentworth size classification (silt, sand, gravel, cobble, boulder)17. Estimate the distance from each thalweg point to the nearest cover object. Note: Fish cover is defined as any structure in the active channel capable of concealing a 20.32 cm (8 in) fish18. Count all pieces of large woody debris within the active channel. Estimate habitat quality with US Environmental Protection Agency (EPA) rapid visual habitat assessments (RVHA) protocols19. Obtain duplicate measurements and samples from a randomly selected 10% of study sites. Duplicate measures are used to estimate sampling and laboratory analysis precision. Note: Describing laboratory protocols for quantifying water chemistry attributes is outside the scope of this manuscript. However, the current study used standard chemical methods for water and wastes14. Subsample organisms contained within each macroinvertebrate sample (collected using protocols in section 2.4) to obtain a representative subsample of the macroinvertebrate community at each site. Place the entire composite macroinvertebrate sample into a 100 in2 gridded sorting (measuring 5 × 20 in2). Randomly assign each 1 in2 grid a number from 1 to 100. Use a stereo microscope to count and identify all organisms within randomly selected 1 in2 grids until the total number of sorted individuals is 200 ± 20%. Identify organisms to genus using macroinvertebrate keys, such as those published by Merritt and Cummins20. Compile genus-level abundance data into community metrics [e.g., total richness and % Ephemeroptera, Plecoptera, and Trichoptera (EPT)] for use as response variables in statistical models and subsequent scenario analysis3, 7. Construct generalized linear models for predicting in-stream physical, chemical, and biological conditions from landscape-based indicators of dominant land use activities. Note: Protocols and analyses were performed in the R language and environment for statistical computing (version 3.2.1)21. Test for normality using Shapiro-Wilk [shaprio.test() function in R package stats21] tests and transform variables to meet assumptions of parametric analyses and linearize relationships. Fit initial maximal models specifying 2-way interactions among all land use predictors [glm() function in R package stats21]. Apply a backward deletion to identify the minimum adequate model3, 7, 22. Identify the least significant (i.e., explains the least amount of variation) variable in the maximal model [summary() function in R package stats21] and fit a new model with this variable excluded [glm () function in R package stats21]. Continue removing variables until all remaining predictors are significantly different from 0 and explanatory power does not differ significantly from the maximal model for each response variable using analysis of deviance tables and likelihood ratio tests [lrtest() function in R package lmtest23]. Use final models to predict physicochemical and biological condition given current landscape characteristics within all un-sampled NHD catchments throughout the target watershed [predict() function in R package stats21]. Visualize predictions in GIS software. Right click on the catchments layer and select Properties. In the Layer Properties dialog box, click on the Symbology tab and select Quantities. Select the predicted value of interest as the Value field and click Apply. Note: Range values can be manually changed to match recognized ecological criteria using the Classify button. Conduct scenario analyses to compare predicted changes in aquatic conditions under various land use scenarios. Update the current landscape dataset to simulate plausible future development or mitigation scenarios. For the study described here, manually update accumulated landscape values for the catchment of interest within the attribute table (e.g., change 10 acres of forested to mining land cover). Select the catchment of interest using the Select by Attribute function located within the Selection drop down menu. In the Select by Attribute dialog box, choose the NHD catchments as the Layer. Double click on the unique identifier attribute, select =, and then type the identifier for the catchment of interest in the equation box. Open the NHD catchment attribute table by right clicking the catchments layer in the table of contents and selecting Open Attribute Table from the drop down menu. Choose to show only selected catchments. With only selected catchments showing, right click on the column of interest and select Field Calculator and input the new simulated value. Note: Multiple catchments can be altered to simulate multiple spatially explicit development or management activities occurring across large spatial scales. Note: Alternatively, original vector and raster datasets can be updated by digitizing new features or altering and removing original features to simulate new land use activity or management of a pre-existing land use impact24. This can be accomplished using the Editor Toolbar. Re-allocate and re-accumulate landscape attributes for all NHD catchments using protocols presented in steps 1.3-1.4. Predict physicochemical and biological condition as a function of the updated landscape dataset [predict() function in R package stats21]. Visualize predicted conditions under alternative land use scenarios using protocols presented in step 4.2.2. Forty 1:24,000 NHD catchments were selected as study sites within the Coal River, West Virginia (Figure 2). 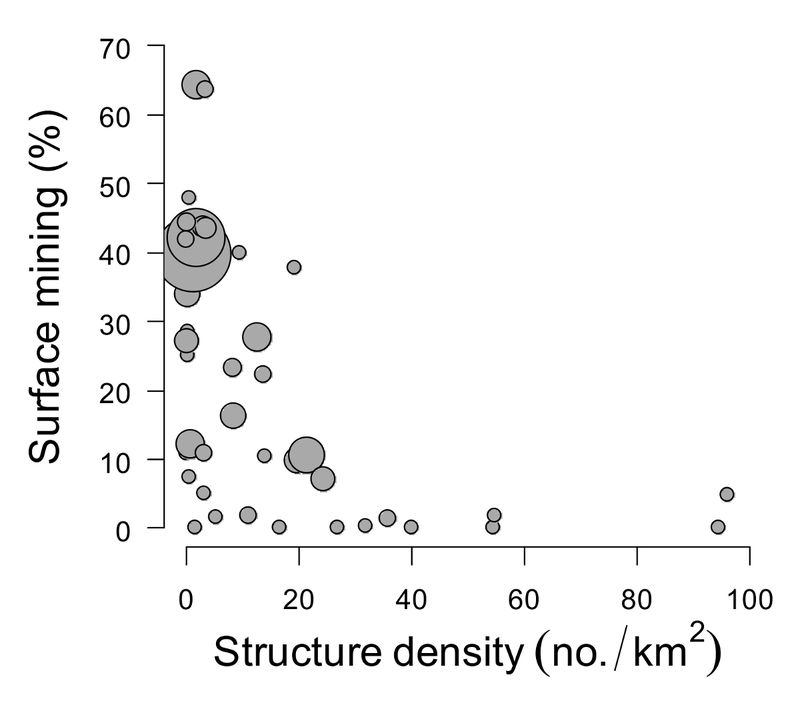 Study sites were selected to span a range influence from surface mining (% land area24), residential development [structure density (no./km2)], and underground mining [national pollution discharge elimination system (NPDES) permit density (no./km2)] such that each major land use activity occurred both in isolation and in combination to the extent possible (Figure 3). At each site, data on physicochemical conditions and macroinvertebrate community structure were collected. In a previous study, these data were used to construct cumulative effects models for predicting West Virginia Stream Condition Index (WVSCI), a family-level multi-metric index of biotic integrity developed for West Virginia25, and specific conductivity with a high degree of precision and accuracy7. Herein, these models are used to predict current and future conditions for two sub-watersheds of the Coal River [Drawdy Creek (Figure 4A) and Laurel Fork (Figure 4B)] under various land use development scenarios. Drawdy Creek and Laurel Fork have nearly identical levels of surface mining and % development (Table 1). However, Drawdy Creek is influenced by residential structures and underground mining, whereas Laurel Fork is not. Consequently, these two watersheds offer a unique opportunity to assess and compare the extent to which cumulative effects of multiple land use activities control current aquatic conditions and the outcome of future land use development scenarios. Laurel Fork was not predicted to exceed chemical (specific conductivity > 500 µS/cm26) or biological criteria (WVSCI < 6825), suggesting it can assimilate additional land use activity without risking impairment (Table 1). A series of scenarios were then assessed to quantify the maximum amount of additional surface mining, underground mining, and residential development Laurel Fork can likely assimilate before its outflow crosses each criterion. To do this, specific conductivity and WVSCI were predicted under the full range of each land use activity while holding the other landscape metrics constant. Scenario analysis suggests Laurel Fork can assimilate 14% (25% total) and 21% (32% total) increases in surface mine lands prior to crossing the specific conductivity and WVSCI criteria, respectively (Figure 5A, 5B). Laurel Fork can also assimilate 8 underground mine NPDES permits and 22 residential structures before crossing the specific conductivity and WVSCI criteria, respectively (Figure 5A, 5B). In contrast, the outflow of Drawdy Creek is predicted to exceed both the chemical and biological criteria, suggesting an inability to assimilate any additional land use development without first mitigating effects of current stressors (Table 1). Consequently, mitigation scenarios that reduce the overall effect size of pre-existing land use activities (e.g., a 10% reduction in the effect of 100 structures would be equivalent to 90 structures) were simulated. 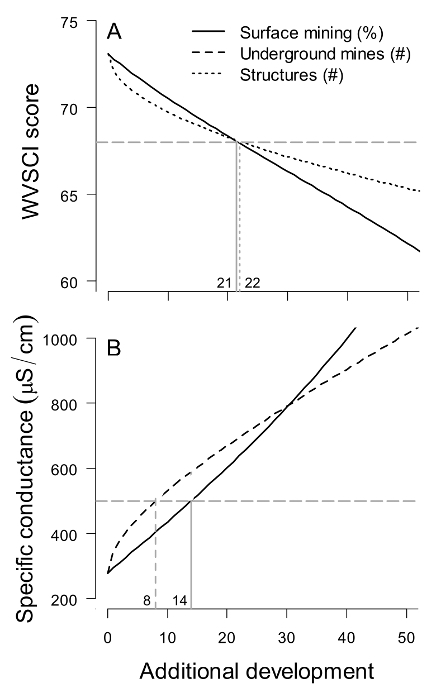 Fully mitigating the effect of residential development and underground mining did not result in a respective increase in WVSCI above 68 or decrease in specific conductance below the 500 µS/cm criterion (Figure 6A, 6B). However, the outflow of Drawdy Creek was predicted to exceed a WVSCI score of 68 and decrease below 500 µS/cm with simultaneous reductions in both residential development and underground mining of a 94 and 75%, respectively. Figure 2. Map of the Coal River watershed. The Coal River watershed is shown with respect to its location within West Virginia. Locations of study sites (n=40) and Laurel Fork and Drawdy Creek sub-watersheds are also presented. Please click here to view a larger version of this figure. Figure 3. Coal River study sites. 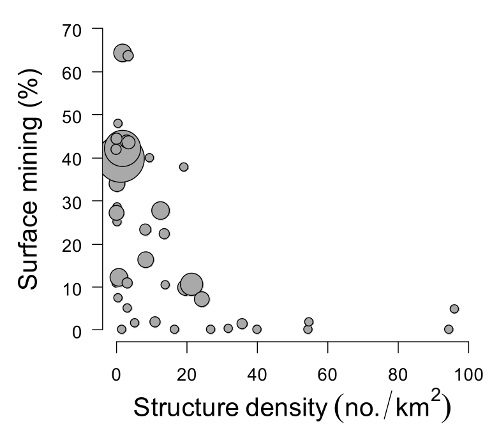 Magnitude of surface mining and residential development for selected study sites (n=40) within independent stressor gradients and their combination. Symbol size is relative to the number of underground mining national pollution discharge elimination system (NPDES) permits. Please click here to view a larger version of this figure. Figure 4. 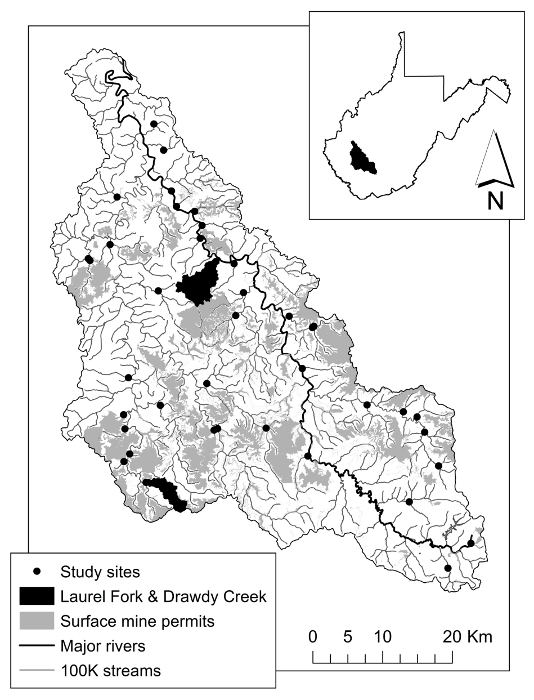 Maps depicting land use activities within Drawdy Creek (A) and Laurel Fork (B). These watersheds represent patterns of land use geography typical throughout the MTR-VF region. Residential development [land cover (as defined by the NLCD) and structures] and mining (underground mining NPDES permits and surface mine extent) land use activities are shown. Additional un-mined permits used in scenario analysis are shown. Refer to Figure 2 for watershed location within West Virginia. Please click here to view a larger version of this figure. Figure 5. Example scenario analysis results predicting in-stream response to simulated land use development within Laurel Fork. Predicted WVSCI scores following simulated increases in surface mining and residential development (A) and predicted specific conductance following simulated increases in surface mining and underground mining (B) within the Laurel Fork watershed. 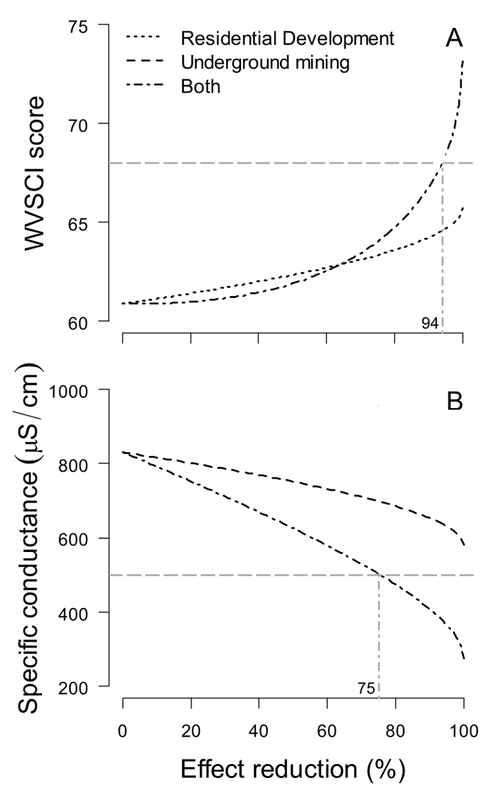 Horizontal lines represent WVSCI (68) and specific conductance (500 µS/cm) criteria. Vertical lines represent additional levels of mining resulting in crossing of each criterion. Units for the x-axis vary depending on the landscape attributes changed under each scenario and correspond to units specified in the legend. Please click here to view a larger version of this figure. Figure 6. Example scenario analysis results predicting in-stream response to simulated mitigation activities within Drawdy Creek. Predicted WVSCI scores (A) and specific conductivity (B) following simulated decreases in the effect size of existing residential development and underground mining, respectively. Predicted conditions following simultaneous reductions in the effect size of both residential development and underground mining are also shown for each response. Horizontal lines represent WVSCI (68) and specific conductance (500 µS/cm) criteria. Vertical lines indicate mitigation activities resulting in improvements beyond each criterion. Please click here to view a larger version of this figure. Table 1. Landscape characteristics and observed and predicted aquatic conditions for Drawdy Creek and Laurel Fork. Land use characteristics (surface mining, underground mining, and residential development) and predicted chemical and biological conditions for Drawdy Creek and Laurel Fork under current landscape conditions and the additional mining scenario. We provide a framework for assessing and managing cumulative effects of multiple land use activities in heavily impacted watersheds. The approach described herein addresses previously identified limitations associated with managing aquatic systems in heavily impacted watersheds5-6. Most notably, the targeted watershed assessment design (i.e., sampling along individual and combined stressor axes) produces data that are well suited for quantifying complex cumulative effects at relevant spatial scales (i.e., watershed scale) via easily interpretable and implementable modeling techniques3, 7. Moreover, these models are readily incorporated into a scenario analysis framework that enables accurate prediction of future management (e.g., restoration and mitigation) and development outcomes. Consequently, the presented approach will likely be of value to aquatic resource managers who increasingly rely on forecasting conditions under various land use scenarios to aid in regulatory decisions27. The contrast between Drawdy Creek and Laurel Fork highlights the utility of the presented framework when managing aquatic systems within actively developing and socioeconomically important regions. Scenario analysis suggested that Laurel Fork, which is impacted solely by surface mining (10.9%), can assimilate additional land use development without exceeding chemical and biological criteria. Drawdy Creek, which is affected by equivalent levels of surface mining (10.7%), is predicted to not meet either criterion as a result of cumulative effects associated with underground mining and residential structures. However, simulated mitigation of non-surface mining stressors (e.g., underground mine effluent and residential wastewater) improved ecological conditions, suggesting strategic management activities could enable further development to occur. Consequently, the presented approach makes it possible to facilitate economic and development activity while also producing opportunity for net benefits through remediation of other stressors28. Successful identification and sampling of dominant land use stressors is a critical step in successfully implementing the methodologies presented herein. It is also critical that sampling and subsequent data analyses are based upon the best available and most up-to-date land cover and use information. Temporal consistency between land cover and in-stream data help ensure accurate statistical relationships and subsequent ecological predictions3, 9. If conducted appropriately, the presented watershed assessment technique produces data that are largely unbiased (i.e., minimizes specification error and omitted variable biases) and unaffected by multicollinearity. Consequently, these data are well suited for predictive modeling via traditional regression techniques. One potential limitation of the current approach, however, is that strong ability to empirically predict spatial pattern does not guarantee an ability to predict change over time. Notably, studies have observed interactions between climate and land use change on physicochemical and biological conditions29-31. Thus, adaptive management approaches that test temporal predictions and update spatial predictive models will be an important component of management efforts. This should involve incorporating climate change into statistical models and subsequent scenario analyses. Our methodology can also be adapted to utilize existing datasets that may not fulfill assumptions of traditional regression techniques (e.g., multicollinearity and sample independence). The use of pre-existing data is beneficial in situations where managers have limited time or resources. Boosted Regression Tree (BRT) models may be particularly useful when analyzing large, pre-existing datasets because they are largely unaffected by multicollinearity, missing data, statistical outliers, and non-normal data32. Moreover, BRT offers high predictive performance and has demonstrated utility in a scenario analysis framework28. It is important to note the context within which our methodology was developed. First, our approach was developed for watersheds characterized by clearly defined land use gradients. However, clearly defined land use gradients do not always occur at the watershed-scale (e.g., areas of the Midwestern United States with little variation in agricultural extent). Consequently, other approaches to conservation planning, such as risk-based methods that rank conservation targets based on risks of multiple land use activities, may be more appropriate33-34. Moreover, our approach was designed at the 8-digit HUC watershed scale. In a previous study, we found that models constructed across multiple 8-digit HUC watersheds fail to predict watershed-specific nuances between land use and in-stream conditions7. Constructing models across smaller spatial scales (e.g., 12-digit HUC watersheds) may constrain sample size and limit the ability of models to quantify complex cumulative effects. However, our approach can be used to manage across spatial scales via a house-neighborhood framework2. Under this framework, restoration and protection priorities are set for individual streams within the context of surrounding conditions. For example, restoration potential increases with increasing neighborhood condition because of benefits associated with having good streams nearby (e.g., high re-colonization potential). We provide and demonstrate protocols for assessing and managing cumulative effects within heavily impacted watersheds. Although the current manuscript focused on construction and implementation of cumulative effects models within a scenario analysis framework, the demonstrated watershed assessment techniques produce data capable of quantifying detailed patterns of physicochemical and biological degradation related to the accumulation of dominant land use activities across larger spatial scales35. Consequently, data produced by the study design and sampling protocols described herein have potential management benefits that extend well beyond those discussed. Perhaps most importantly, this framework is transferable to other watersheds facing ongoing transitions in any number of land use activities. We thank the numerous field and laboratory helpers that were involved in various aspects of this work, especially Donna Hartman, Aaron Maxwell, Eric Miller, and Alison Anderson. Funding for this study was provided by the US Geological Survey through support from US Environmental Protection Agency (EPA) Region III. This study was partially developed under the Science To Achieve Results Fellowship Assistance Agreement number FP-91766601-0 awarded by the US EPA. Although the research described in this article has been funded by the US EPA, it has not been subjected to the agency's required peer and policy review and, therefore, does not necessarily reflect the views of the agency, and no official endorsement should be inferred. Allan, J. D. Landscapes and riverscapes: the influence of land use on stream ecosystems. Annu. Rev. Ecol. Evol. Syst. 35, 257-284 (2004). Merovich, G. T., Petty, J. T., Strager, M. P., Fulton, J. B. Hierarchical classification of stream condition: a house-neighborhood framework for establishing conservartion priorities in complex riverscapes. Freshwater Science. 32, 874-891 (2013). Merriam, E. R., Petty, J. T., Strager, M. P., Maxwell, A. E., Ziemkiewicz, P. F. Scenario analysis predicts context-dependent stream response to land use change in a heavily mined central Appalachian watershed. Freshwater Science. 32, 1246-1259 (2013). Petty, J. T., Fulton, J. B., Strager, M. P., Merovich, G. T., Stiles, J. M., Ziemkiewicz, P. F. Landscape indicators and thresholds of stream ecological impairment in an intensively mined Appalachian watershed. J. N. Am. Benthol. Soc. 29, 1292-1309 (2010). Seitz, N. E., Westbrook, C. J., Noble, B. F. Bringing science into river systems cumulative effects assessment practice. Environ. Impact Asses. 31, 172-179 (2011). Duinker, P. N., Greig, L. A. The importance of cumulative effects assessment in Canada: ailments and ideas for redeployment. Environ. Manage. 37, 153-161 (2006). Merriam, E. R., Petty, J. T., Strager, M. P., Maxwell, A. E., Ziemkiewicz, P. F. Landscape-based cumulative effects models for predicting stream response to mountaintop mining in multistressor Appalachian watersheds. Freshwater Science. 34, 1006-1019 (2015). Duinker, P. N., Greig, L. A. Scenario analysis in environmental impact assessment: improving explorations of the future. Environ. Impact Asses. 27, 206-219 (2007). Kepner, W. G., Ramsey, M. M., Brown, E. S., Jarchow, M. E., Dickinson, K. J. M., Mark, A. F. Hydrologic futures: using scenario analysis to evaluate impacts of forecasted land use change on hydrologic services. Ecosphere. 3, 1-25 (2012). Gergel, S. E., Turner, M. G., Miller, J. R., Melack, J. M., Stanley, E. H. Landscape indicators of human impacts to riverine systems. Aquat. Sci. 64, 118-128 (2002). McKay, L., Bondelid, T., Dewald, T., Johnston, J., Moore, R., Rea, A. NHDPlus Version 2: User Guide. (2012). Strager, M. P., Petty, J. T., Strager, J. M., Barker-Fulton, J. A spatially explicit framework for quantifying downstream hydrologic conditions. J. Environ. Manag. 90, 1854-1861 (2009). WVDEP (Virginia Department of Environmental Protection). Standard operating proceedures. West Virgina Department of Environmental Protection. Charleston, West Virginia. (2009). EPA-60014-79-020. USEPA. Methods for chemical analysis of water and wastes. Environmental Monitoring Systems Support Laboratory, Office of Research and Development, US Environmental Protection Agency. Cincinnati, Ohio. (1983). Merriam, E. R., Petty, J. T., Merovich, G. T., Fulton, J. B., Strager, M. P. Additive effects of mining and residential development on stream conditions in a central Appalachian watershed. J. N. Am. Benthol. Soc. 30, 399-418 (2011). Bisson, P. A., Nielsen, J. L., Palmason, R. A., Grove, L. E. A system of naming habitat types in streams, with examples of habitat utilization by salmonids during low streamflow. Acquisition and utilization of aquatic habitat inventory information. Proceedings of a symposium held 28-30 October, 1981. Armentrout, N. D. Western Division of the American Fisheries Society. Bathesda, Maryland. 62-73 (1982). Wentworth, C. K. A scale of grade and class terms for clastic sediments. J. Geol. 30, 377-392 (1922). Petty, J. T., Freund, J., Lamothe, P., Mazik, P. Quantifying instream habitat in the upper Shavers Fork basin at multiple spatial scales. Proceedings of the Annual Conference of the Southeastern Association of Fisheries and Wildlife Agencies. 55, 81-94 (2001). Barbour, M. T., Gerritsen, J., Snyder, B. D., Stribling, J. B. EPA/841-B-99-022. Rapid bioassessment protocols for use in streams and wadeable rivers: periphyton, benthic macroinvertebrates, and fish. 2nd edition. US Environmental Protection Agency. Washington, DC. (1999). An introduction to the aquatic insects of North America. 4th edition. Merritt, R. W., Cummins, K. W. Kendall/Hunt Publishing Co. Dubuque, Iowa. (2008). A language and environment for statistical computing. R Foundation for Statistical Computing. Vienna, Austria, http://www.R-project.org. Available from: http://www.R-project.org (2014). Crawley, M. J. Statistics: an introduction using R. Wiley and Sons. Chichester, UK. (2005). Zeileis, A., Hothorn, T. Diagnostic Checking in Regression Relationships. R News. 2, 7-10 (2002). Maxwell, A. E., Strager, M. P., Yuill, C., Petty, J. T., Merriam, E. R., Mazzarella, C. Disturbance mapping and landscape modeling of mountaintop mining using ArcGIS. Proceedings of the ESRI International User Conference. San Diego, California. (2011). Gerritsen, J., Burton, J., Barbour, M. T. A stream condition index for West Virginia wadeable streams. Tetra Tech, Inc. Owings Mills, Maryland. (2000). Pond, G. J., Passmore, M. E., Borsuk, F. A., Reynolds, L., Rose, C. J. Downstream effects of mountaintop coal mining: comparing biological conditions using family- and genus-level macroinvertebrate bioassessment tools. J. N. Am. Benthol. Soc. 27, 717-737 (2008). Luo, Y., et al. Ecological forecasting and data assimilation in a data-rich era. Ecol. Appl. 21, 1429-1442 (2011). Petty, J. T., Strager, M. P., Merriam, E. R., Ziemkiewicz, P. F. Scenario analysis and the Watershed Futures Planner: predicting future aquatic condiditons in an intensively mined Appalachian watershed. Environmental Considerations in Energy Productions. Craynon, J. R. Society for Mining, Metallurgy, and Exploration. Englewood, CO. 5-19 (2013). Daraio, J. A., Bales, J. D. Effects of land use and climate change on stream temperature I: daily flow and stream temperature projections. J. Am. Water Resour. As. 50, 1155-1176 (2014). Mantyka-Pringle, C. S., Martin, T. G., Moffatt, D. B., Linke, S., Rhodes, J. R. Understanding and predicting the combined effects of climate change and land-use change on freshwater macroinvertebrates and fish. J. Appl. Ecol. 51, 572-581 (2014). Piggott, J. J., Townsend, C. R., Matthaei, C. D. Climate warming and agricultural stressors interact to determine stream macroinvertebrate community dynamics. Glob. Change Biol. 21, 1897-1906 (2015). Elith, J., Leathwick, J. R., Hastie, T. A working guide to boosted regression trees. J. Anim. Ecol. 77, 802-813 (2008). Mattson, K. M., Angermeier, P. L. Integrating human impacts and ecological integrity into a risk-based protocol for conservation planning. Environ. Manage. 39, 125-138 (2007). EPA 841-B-11-002. USEPA. Identifying and protecting healthy watersheds. Concepts, assessments, and management approaches. (US, U. S. E. P. A. US Environment Protection Agency, Office of Water, Office of Wetlands, Oceans, and Watersheds. Washington, DC. (2012). Merriam, E. R., Petty, J. T., Strager, M. P., Maxwell, A. E., Ziemkiewicz, P. F. Complex contaminant mixtures in multi-stressor Appalachian riverscapes. Environ. Toxicol. Chem. (2015).